Areej Apartments by Arada ... construction contract awarded to Modern Building Contracting Company. Arada, the developer of the mega Aljada project in Sharjah, UAE, has awarded the first construction contract for the project. The developer handed the main construction contract for the first four Areej Apartments blocks, based within Phase One of the mixed-use development, to Modern Building Contracting Company (MBCC), a major contractor that has worked on sites in the UAE and Saudi Arabia. Full construction on the project was set to commence by the end of July. In total, over 250 units will be built across the four Areej apartments blocks. The buildings, which contain the first homes within the 24-million-sq-ft project, are scheduled to be completed by the end of 2019. Aljada, the Dh24-billion ($6.53 billion) mixed-use lifestyle destination, is located on the last large plot of undeveloped land in the heart of Sharjah. 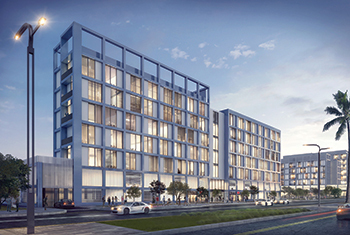 In April, Arada announced the launch of East Village, a 15-building creative community targeting the younger generation, which constitutes Phase Two of Aljada, while also confirming that enabling work onsite had begun. Also in April, Arada signed a management agreement with Emaar Hospitality Group to bring three new hotels – Address Aljada Sharjah, Vida Aljada Sharjah and Rove Aljada – to the megaproject. In March, Arada announced that Zaha Hadid Architects had won a global competition to design the Central Hub, the focal point of Aljada, and a new leisure and entertainment destination for the UAE. The first phase of the Central Hub will be completed by the end of this year. In January, the developer also confirmed that the global engineering giant Jacobs had won a key contract to design the infrastructure for the project. The project, which was launched in September 2017 is to be delivered in phases starting in 2019, with the entire development expected to be completed by 2025. The Aljada masterplan is carefully designed with wide green spaces within a fully integrated and sustainable community.